Arles, Roman and Romanesque Monuments, represents the evolution of a classical Roman settlement into an important medieval city. The WHS comprises a serial nomination of 8 sites. The Church of St. Trophime, formerly a cathedral, is a major work of Romanesque architecture, and the representation of the Last Judgment on its portal is considered one of the finest examples of Romanesque sculpture, as are the columns in the adjacent cloister. Arles is a more lively town than the similar Orange. Extremely touristy too, especially the area around the amphitheatre. This Roman building occupies a central space in town worthy of a cathedral. It's still in use as a bull ring. The nearby Roman theatre holds not much more than remains. Closeby (and signposted) lies the most important romanesque monument of Arles: the Church of St. Trophime. Its exterior decoration is excellent. Inside mainly the huge tapestries draw the attention. Somehow I missed the entrance to the cloisters, which are said to be rich in carvings too. Finally I walked south to the cemetery of Les Alyscamps. I had my backpack with me (including electronics such as laptop and Kindle) as a was on my way to the airport in Marseille. I was a bit worried roaming around a desolate necropolis with all my valuables, but Les Alyscamps proved to be almost as touristy as the rest of Arles. It's a nice place for a stroll though, and peek into the old church that now is the domain of numerous pigeons. 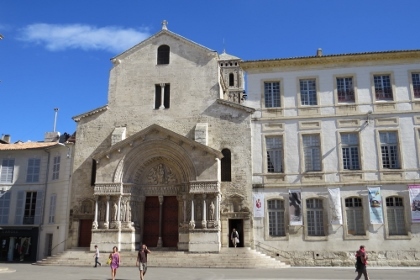 To most people, Arles seems to be best known for its association with Van Gogh, but of course, for those with an interest in ancient and medieval history, the city has much more to offer. The Amphitheatre is a massive and very impressive building that hosted gladiator fights for many centuries, and is today used for plays, concerts, and the French variant of bullfighting. The Church of St. Trophime, a former cathedral, features great Romanesque sculptures at the front side and also includes a cloister that is one the finest and best preserved anywhere. The Cryptoporticus, built as a foundation for the forum, is a huge underground space that provides pleasant shade and cool temperatures on a hot summer day. Other parts of the sites are the Roman theatre, the Thermal Baths of Constantine, and the interesting Alyscamps necropolis (meaning “Elysian Fields” in Occitan), which features many ancient sarcophagi and is also included in the Routes of Santiago listing, as the medieval Church of St. Honorat was a popular gathering point for pilgrims. There are not many places outside of Italy where so many Roman monuments can be found so close together, and in such high quality – but of course, the entire region, with Orange, Nimes and the Pont du Gard, is a true Roman hotspot. 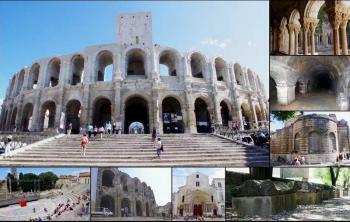 Arles has been inscribed for both its Roman and Romanesque remains. The city is a „good example of the adaptation of an ancient city to medieval European civilization“ (from the Advisory Board Evaluation). This can still be seen at the amphitheatre. After the fall of the Roman Empire, it was transformed into a fortress with houses and chapels inside of the arena. In the 19th century the amphitheatre was rebuilt in its original form and the later additions were removed, with the exception of three medieval towers that protrude from the upper tier. The amphitheatre has recently been refurbished and appears again in bright white. It was fun to climb on the upper tier of the arena (surprisingly there was no fence or barrier), with nice views to the surrounding houses and the narrow and winding streets of the old town centre. The other Roman remains in the town centre are less striking: the Roman theatre has suffered substantial damage, only two Corinthian columns, the Orchestra and a few terraces for the spectators are preserved. Further: the Roman forum (only two columns and a part of the cornice, now part of the façade of a hotel), the Therms of Constantine, and the remains of the Roman ramparts. Worth seeing is the Cryptoporticus, an underground vaulted gallery once constructed to support the Roman forum. The entrance is in the hall of the Hôtel de Ville. The most important Romanesque site is the Church of Saint Trophime. The church is famous for the portal and the cloister of the former monastery. We have seen a lot of church portals and sculptures during our trip to South France, but the portal of Saint Trophime was one of the most impressive. The sculptures and relief are magnificent, in particular the tympanum with the depiction of the apocalypse according to St John, the evangelists and the apostles. The cloister can easily be missed, because you can not enter from the church. There is a separate entrance adjacent to the church from the Place de la République. I enjoyed most our walk to the Alyscamps, the Roman necropolis, just a short distance from the old town. It was one of the largest and most important ancient burial sites. 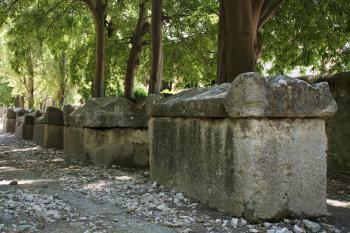 Along an alley are long rows of Roman sarcophagi, most of them plain and undecorated (photo). The road ends at the small and unfinished, but very charming, church of Saint Honorat. A collection of sculptured and decorated sarcophagi is shown in the Musée départemental Arles antique. A visit is worthwhile, the museum shows also some Roman mosaics, models of the ancient city and the Roman buildings, and a replica of the Venus of Arles (the original is in the Louvre in Paris). We visited Arles in June 2013, we stayed three days there and took it as a base for daytrips to Marseille and the Camargue. In the evening the most lively area is the Place du Forum and the adjacent streets with many restaurants, cafés and bars. I visited this WHS in May 2012. Although the Roman arena was the highlight of my visit, still I felt Arles had seen better days and now was pretty much neglected. It was quite dirty and the whole place didn't feel very safe in general. Nearby Nimes, is not a WHS but its Roman arena and other remains are better kept and looked after and overall the city has much more to offer. 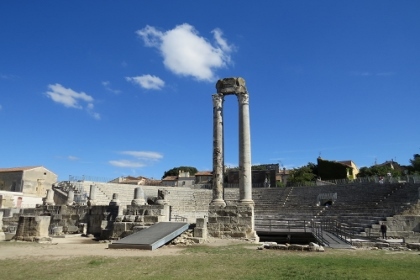 The historic site of Arles comprises several building and monuments however the best ones are the Roman theatre and the Arenas that have been well conserved until today. The theatre, conversely from the one in Orange, has lost its stage and its facade a long time ago. Only the tier is still in place. The Arenas still offer a tremendous testimony of the Roman life and compose with the Pont du Gard and the Orange Theatre the greatest Roman remains in France. A renovation campaign has begun several months ago and will allow to maintain the beauty of the site for a long time. If you have the time, give a look to the Triumphal Arch and the different Roman and Romanesque monuments of the historic center. I had a really nice day in Arles late September 2006. Probably the most famous site is the Roman Amphitheatre, and this is a good site to start off with, it is impressive but not the best example of its kind, perhaps even the one in nearby Nimes is better preserved. 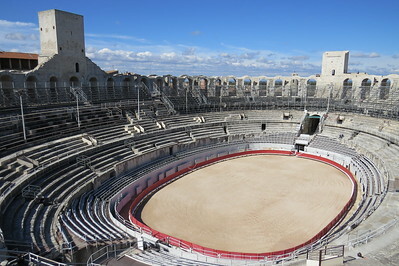 It is still in use however and there are regular bull-fights here, in what is the bullfighting capital of France. One Roman site that is well worth getting to though is les Alychamps, it is a short ten minute walk south from the centre. It was originally a roman cemetery and became one of the earliest Christian sites in France as it was the place for clandestine meetings. The church of St Honorat is at the end of the cemetery and this is included in the Route to Santiago de Compestella WHS of which Arles was one of the four starting points in France so it is quite an important aspect of the inscription also it provides two WHS for the price of one! This was perhaps my favourite part of Arles, the church was empty and had a real eerie feel. Other major roman remains are the Theatre, which is nice but nothing spectacular, the crypts (they were closed when I visited in 2006) the baths which I didn’t get to see. The Romanesque buildings are dotted around the centre, the major point though is the Cathedral of St Trophime (pictured). It boasts one of the most impressive collections of Romanesque statues anywhere, the impressively restored main entrance and Cloister are fantastic. It is the combination of the two aspects of Arles’ history that make this such an important site and it is a really lovely city to visit, with lots of nice cafés and plenty to interest fans of Van Gogh who spent a few years here and many points around the town are have been made famous by his paintings. It is easy to reach, with regular trains from Avignon (20 mins), Marseille (40 mins) among many. You can pay for each site individually or there is a €13 ticket that covers all the sites mentioned above plus a whole host more making it good value. Arles was a really nice city to visit and the sites, though perhaps not the most impressive of there kind, do combine to make this a worthwhile inclusion on the world heritage list. 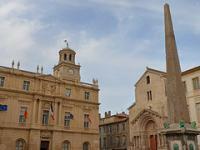 In our trip to France we have visited the beautiful town of Arles. The most important monument is the amphitheatre, with two storeys and Doric arcades, very well preserved because in the Medieval times it became a fort: from that remain three medieval towers. Beautiful are the remains of the Roman theatre, with the steps, the orchestra and the two high columns; it had three storeys of arches, like you can see from the part of it that is included in the walls. The cryptoportica (subterranean galleries) were used to stabilize the Forum (of which you can see two columns of a temple on the overlooking Forum Square) and as a deposit of grain; it has a horseshoe form and big pillars and arches. Near that are the impressive remains of two rooms (tepidarium and calidarium) with an apse of the Constantine Baths, the Roman exedra, that was part of a basilica, and the Roman walls with the Gate of the Cavalry. The Cathedral of St. Trophime, that was also with Les Alyscamps one of the points of departure of the pilgrimage to Santiago de Compostela, is a masterpiece of the Romanesque architecture (only the chapels and the apse are Gothic and the transept is later) and has a stunning portal with statues relieves, columns, pilasters, capitals, cornices, lintels, tympanums and statues of lions. Inside there are three naves, the main with ogival vaulting, the lateral with barrel vaulting, tapestries and a early Christian sarcophagus. The same two types of vaulting has the cloister, with a Romanesque part and a Gothic part and arcades, statues, relieves, double columns, pilasters and capitals; nice is the chapter house, that contains tapestries. 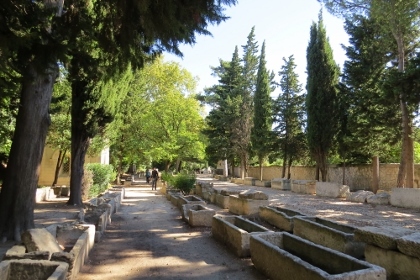 In the Roman, early Christian and medieval cemetery Les Alyscamps there is a long avenue bordered by old cypress trees and sarcophaguses, that ends at the church of St. Honorat, that has a nice façade, an octagonal tower and a nave and contains sarcophaguses. 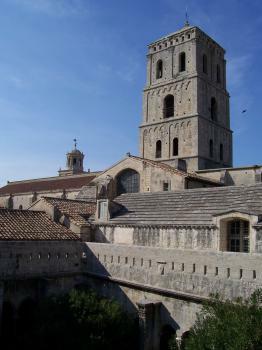 Near Arles there is, on a hill, the beautiful Romanesque abbey of Montmajour with the church of Our Lady, that has a nave, a transept and a nice crypt, with a choir, an ambulatory and lateral chapels. The nice cloister has columns, capitals and arches. Near that is the rectangular Abbey tower, a rock cemetery and the churches of St. Peter, with two naves (one of which is dig up in the rock), and of the Holy Cross. Arles is one of the most beautiful places I have ever seen because of the beauty and diversity of the period of construction of its monuments but I was disappointed by the fact that some monuments were closed. It's absolutely worth to be visited, also because has the most beautiful amphitheatre in France, and justifies the inscription, but I think that also other Roman monuments in Provence (like that in Nîmes or Saint-Rémy-de-Provence) could be inscibed alone or together with one, two or all of the WHS of Arles, Orange and Pont du Gard. From "Roman and Romanesque Monuments of Arles" to "Arles, Roman and Romanesque Monuments"
Moved from location of original construction: The Roman obelisk was originally erected in the 4th century in the center of the "spina" of the circus of Arles. After the Roman era, it was abandonned and fell down or was toppled and broke into two parts. Louis XIV had it placed at its present position in front of the town hall. 308 Community Members have visited.